Mind Control: Everything You Know Is Wrong! EVERYTHING THEY TOLD YOU IS WRONG! – Learn How Government Brainwashing Works Often the question is posed, “How do I know that I have no control? I feel in control…” Frankly, the answer is, Everything You Know is Wrong. Beyond a shadow of a doubt, your government is lying to you and planning ways to make you a controllable asset more readily and stealthily. Arm yourself with knowledge. Shield yourself with wariness. Always question the things that happen in your life and always fight to say that you were the harbinger of either your success or your doom. When others control you to serve their purposes, it makes you a tool – a literal piece of handy machinery being used to make someone just like you more money, more famous, more glorified, etc. Don’t do it. Stand up, assert your rights and protect your mind. We will see a revolution soon and when we do, it’ll become obvious how well prepared our government is at repressing resistance to their control. Grab your copy today! 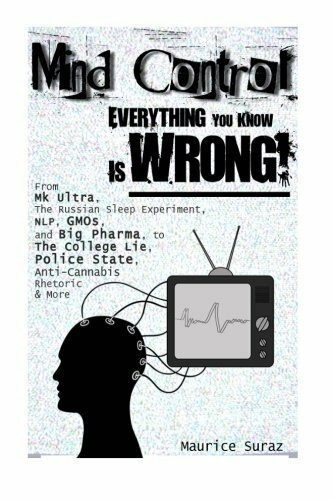 Receive this valuable information through “Mind Control: Everything You Know Is Wrong!” to gain insight into what is really going on. I will see you on the other side.